This evening as I was sitting in my comfy chair, I noticed Stitch (one of the cats) pawing at the window. We live in the woods, so it is common for insects to land on the outsides of the windows after dark, attracted to the lights from within our home. Stitch was especially interested in a rather large beetle crawling frantically on the window, which I recognized quickly as the cerambycid beetle, Orthosoma brunneum. This big brown beetle is a member of the root-boring subfamily Prioninae, and although it is perhaps one of the commonest longhorned beetles in our area during July and August, I’ve not yet photographed it. As I debated whether to do so, I noticed the distinctive silhouette of another cerambycid beetle sitting quietly lower down on the window—smaller than O. brunneum but still decent-sized. I opened the window a crack (to keep all the other insects from rushing in), reached my hand through the crack, grabbed the beetle and in pulled it inside. It was a fine specimen of what is now known as Elytrimitatrix undata. I forgot all about the Orthosoma beetle and decided to photograph Elytrimitatrix instead. 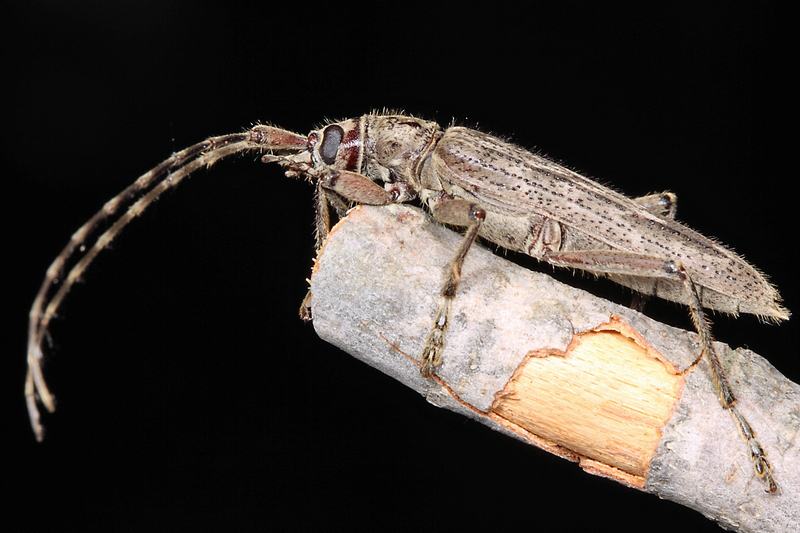 While a member of the longhorned beetle family Cerambycidae, the group to which this species belongs (subfamily Disteniinae) has long been treated as sort of the “red-headed stepchild” of the family due to disagreement about its affinities to other cerambycid groups. It has at times been considered a tribe of the subfamily Lepturinae, a tribe of the subfamily Cerambycinae, a subfamily of its own, and even a separate family. Much of this disagreement focuses on details of its morphology despite the great superficial resemblance of the adults to other cerambycids. 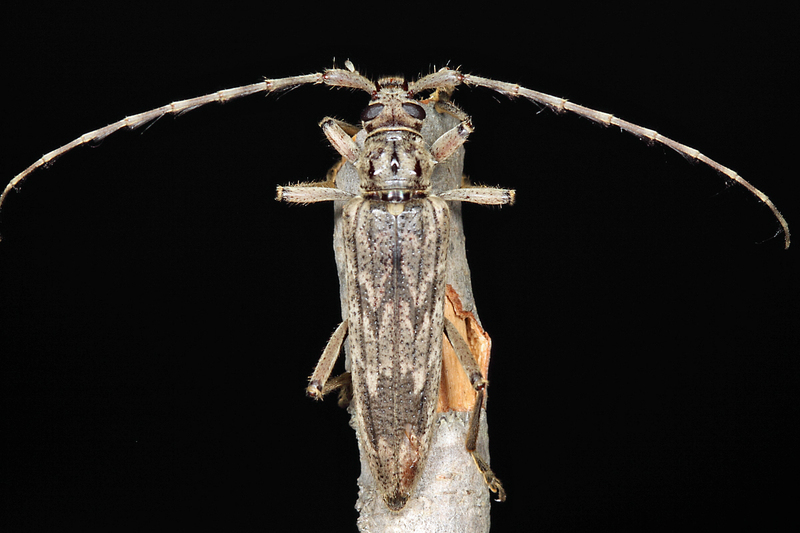 For now, it seems most workers are satisfied to regard the group as a distinct subfamily within the Cerambycidae, even though its exact relationships to other subfamilies still remain unclear. Despite numerous representatives in the Neotropics, E. undata is the only member of the subfamily in the U.S., occurring broadly across the eastern and central states. For many years it was known as “Distenia” undata but was recently split out of that genus by Santos-Silva & Hovore (2007). Larvae have been recorded breeding in the dead wood of a variety of hardwoods as well as pine (the ultimate generalist), and adults are regular visitors at lights during the warm, muggy months of summer. I have also taken the species in numbers in traps baited with fermenting liquid (1 part molasses, 1 part beer, 8 parts water, and a packet of dry yeast) (MacRae 1994). 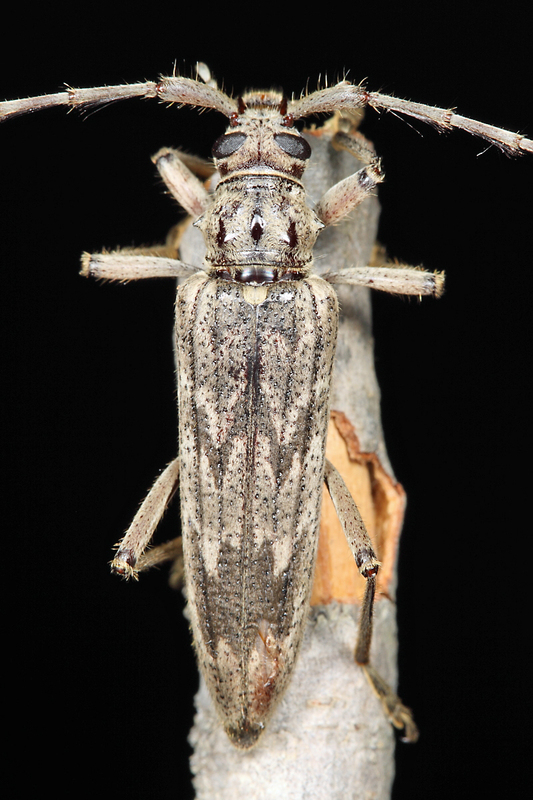 This entry was posted in Cerambycidae, Coleoptera and tagged beetles, entomology, insects, longhorned beetles, Missouri, nature, science. Bookmark the permalink. Saw this one at the porch light myself recently. Thanks for the ID! First one I’ve ever seen here at the house. This is usually more of a ‘high quality’ forest species. Beautiful shots once again Ted. Found one June 1, 2013 in Lufkin, TX, Angelina County, in the back of my pickup, mid-day. They are rather common around here as I see some every year, usually at lights.